Out of Print—reissued in an 'Expanded Edition' w/ 3 newly added bonus tracks October 28, 2014. 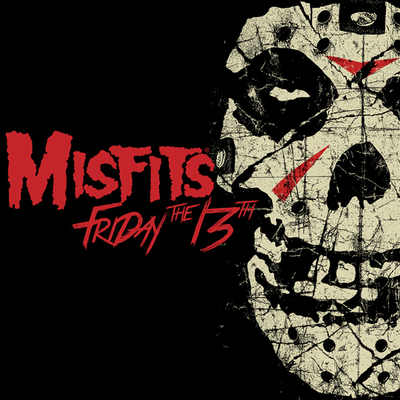 Jerry Only’s long awaited Misfits special project showcasing punk covers of 1950’s era classics has arrived! Nothing short of an all-star line-up from the punk genre (and then some) has assembled to bring this creature to life. All tracks feature Misfits founding member Jerry Only heading the attack on Bass and lead vocals with Marky Ramone of The Ramones adding his world famous flair on drums and percussion that landed him the honor of induction into the Rock and Roll Hall of Fame and Dez Cadena of Black Flag using various guitars adding just the right sound to fit each song. 1960’s pop-rock icon Ronnie Spector known for the classic hits “Be My Baby” and “Baby I love You” (to name just a few), lends her inimitable vocals to “This Magic Moment” and “You Belong to Me”. Jimmy Destri of Blondie contributes his expertise on keyboards for the cuts “Runaway” & “Great Balls of Fire”. 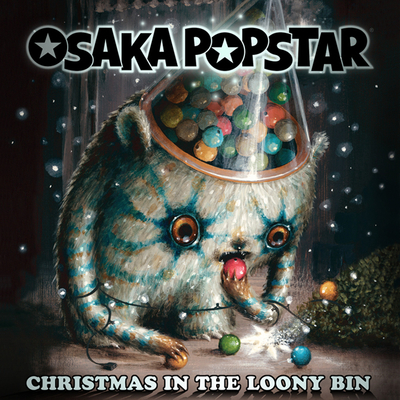 Also featured is long time Misfits collaborator John Cafiero (Osaka Popstar) contributing melodic punk-pop backing vocals to “Dream Lover”, “Monster Mash” and “Runaway”. Ed Manion who has performed with a wide variety of artists including Del Shannon provides saxophone for “Diana” and “Runaway”. The gamut of 50’s era music has been reinterpreted for this special project along with a couple of hits from the 60’s that were must haves for this theme driven collection. The CD is truly unique and not to be perceived as a traditional Misfits album but rather a special project. Only states: “The backbone of punk has always been the 3-chord progression which was ultimately inspired by classic rock and roll of the 1950’s. 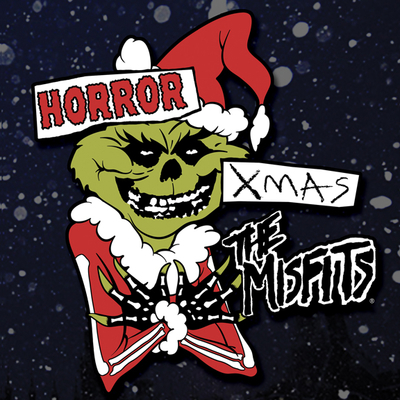 I’ve always wanted to record some of the music that inspired the Misfits to show fiends where it all began. 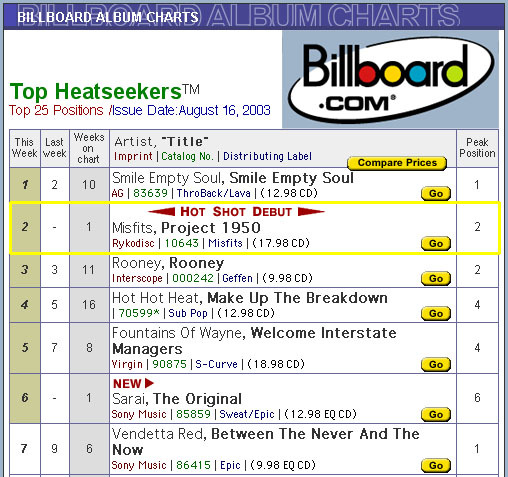 With this album…I will.” Upon it¹s release, “Misfits Project 1950²” debuted on Billboard’s Heatseekers Chart at #2 and Billboard’s Top Independent Albums Chart at #5! Misfits Project 1950 CD/DVD came complete with a 24 page booklet of extensive liner notes, personal quotes on the project from each Jerry, Marky and Dez and even a music lesson 101 section from Jerry Only entitled “Rock and Roll DNA” which explains in great detail (charts and all!) Only’s musical theory of punk rock evolution through 50’s chord progressions. The booklet features a wide variety of all new cartoon art created specifically for this release by artist Tony Squindo, well known for his caricatures of Metallica among others. This limited edition 2003 CD pressing was packaged in a dual jewel case containing a Bonus DVD featuring 10 songs with live performances shot in March 2003 at the Phillips U.S. Open Snowboarding Championships, the 2002 NYC Halloween show, bonus videos of the Misfits and Balzac performing together live in Japan and more eye candy exclusive to this release! A Japanese Import Edition of the CD was also released in 2003 (featuring the same ten tracks found on the U.S. and European CD), but the bonus DVD was replaced with a special Ltd Ed 5-Inch vinyl single. The collectible mini record contains the Misfits studio version of Balzac’s song “Day the Earth Caught Fire” on Side A, with a live version on Side B. The B-Side, performed by Balzac with Jerry Only on guest vocals, was recorded live in concert in Japan 2002 and not available elsewhere. 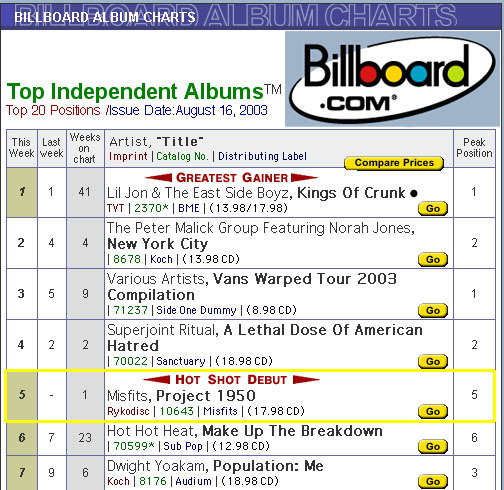 “MONSTER MASH” HITS RADIO & RANKS #1 ON THE SUBMODERN SINGLES CHART! 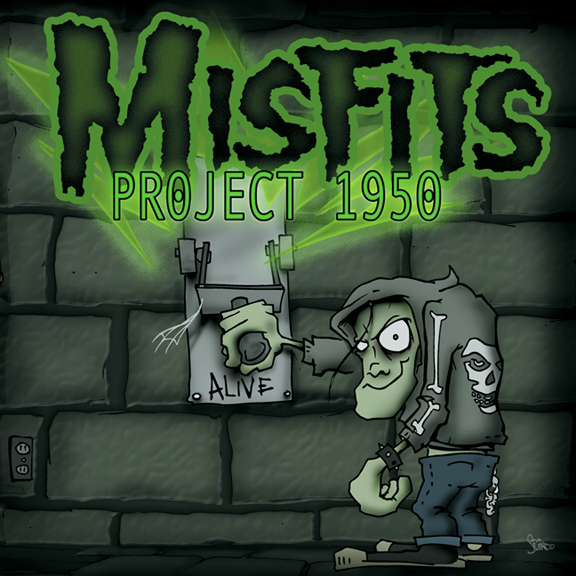 Misfits Project 1950 made a ‘graveyard smash’ on radio. On November 3rd, 2003 FMQB’s SubModern singles chart reported the album’s cover version of “Monster Mash” in the #1 slot! CLICK HERE for the story direct from the FMQB website. 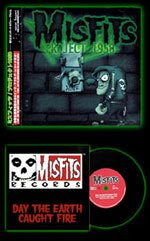 During its initial release in 2003, three different official Limited edition vinyl pressings of Misfits Project 1950 were issued throughout North America and Europe. North American 1st Pressing: SOLID BLUE 180 gram Vinyl limited to 1,000 units worldwide. North American 2nd Pressing: Transparent PURPLE Vinyl limited to 1,000 units worldwide. Euro Import Pressing: 180 gram SLIME GREEN vinyl limited to 3,000 units worldwide. The BLUE & PURPLE vinyl editions were both packaged in a glossy gatefold sleeve containing all art and liner notes featured in the CD booklet. 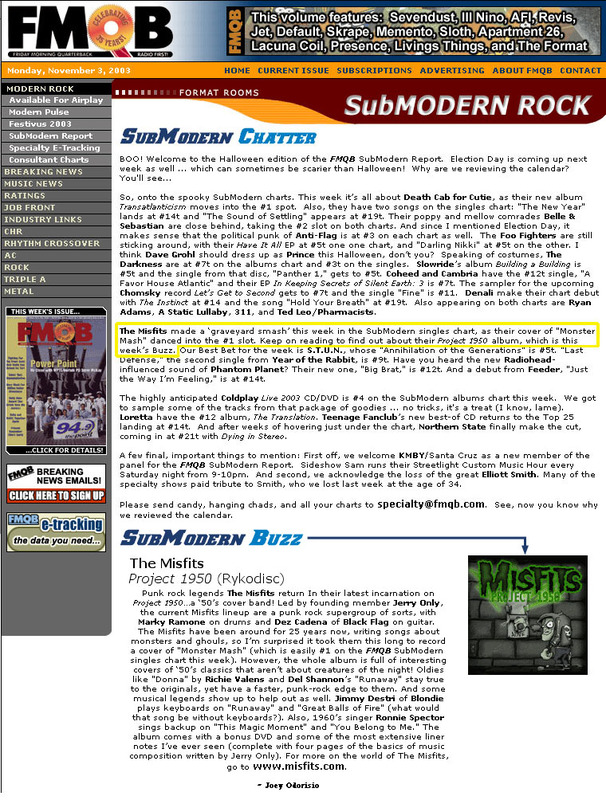 Additional info about Misfits tuning that did not appear in the liner notes of the 2003 CD/DVD package was added to the Rock and Roll DNA section of the liner notes. This same tuning info was later added to the CD package when the Project 1950 Expanded Edition was released in 2014. The Vinyl LPs contained the same 10 tracks found on the 2003 CD (5 cuts on side A and 5 cuts on side B).